Despite laws to discourage women from western frivolities, underground boutiques flourish in Tehran to feed Iranian obsession with fashion. In Iran, medical shortages are just one of the many negative results of a regime under sanctions. 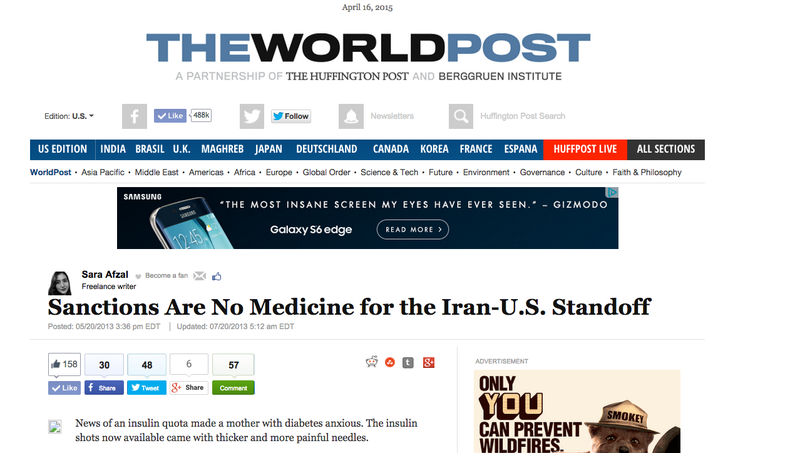 But for some Iranians with medical conditions the lack of access to medications is life threatening, and at times, creates a crisis situation for families. Medicines treating diabetes, cancer, heart disease, hemophilia, multiple sclerosis, and other life-threatening diseases are especially becoming harder to find. Brazil’s soccer-obsessed fans would be ecstatic if the national team known as the “Pentacampeões,” or the five-time champions, won the FIFA World Cup on home soil. But this year, even though the World Cup is taking place in the country synonymous with the sport, many Brazilians are not excited about the competition. If Syria’s conflict took place in the U.S., New York City’s bustling metropolis of 8.3 million people would be deserted entirely: The beaming Times Square would be dark, empty and war torn, and people would flee to other less populated cities and towns. Since the launch of Instagram Video in June, media organizations have experimented with 15-second video as a news vehicle. However, there is a clear divide between the strategies of legacy news organizations and newer startups. It’s a simple idea: Take a candid portrait of someone on the street, and tell an authentic story about his or her life. The idea first came from the Humans of New York Facebook page, which was created by Brandon Stanton in 2010. Since then, “Humans of” pages from around the world have been cropping up online since 2012.